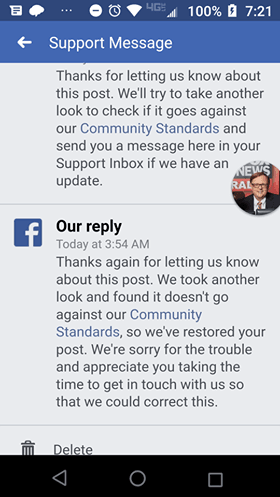 I receive daily notifications from our readers that Facebook blocks our content from your news feeds. We have more than 260,000 followers, but only a handful of you are actually seeing our content on your news feeds. It’s a troublesome issue. That’s why we launched a free weekly newsletter — to bypass the intolerant social media monitors. Click here to subscribe. But Facebook is free to censor and shadowban and block because they own the website. They pay the bills. Still, I can’t help but be frustrated when I hear that the faceless overlords at Facebook are intentionally targeting gun-toting, Bible-clinging Deplorables. The other day I received a message from a reader who was banned from sharing a column I had written for Fox News. The column was about California Democrats cracking down on churches and Christian counselors. 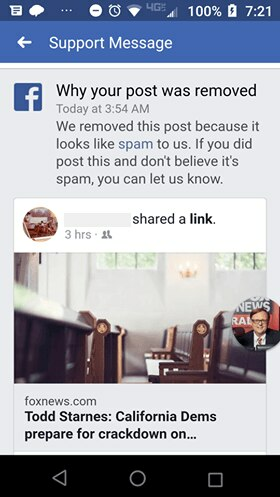 “We removed this post because it looks like spam to us,” a Facebook censorship goon wrote. The reader challenged the decision and eventually they reposted the column. I wonder how many others have faced similar issues with Facebook? And I wonder how many others would follow through and challenge Facebook? Facebook once promoted itself as a place for community – but it turns out they really just want to be a gathering place for leftwing lemmings.